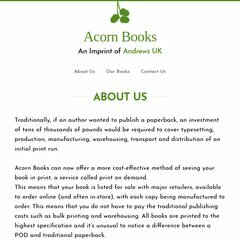 www.Acornbooks.co.uk - Acorn Books | Welcome! Topics: List All, Instructions, and Oak Hill College. It is hosted by Cam Colocated Customers (England, Cambridge,) using Apache/2 web server. Its 2 nameservers are ns1.mythic-beasts.com, and ns2.mythic-beasts.com. Its IP Number is 93.93.131.30. PING www. (93.93.131.30) 56(84) bytes of data.